Oak bullet galls have reached their maximum size for the season and will soon release their developing female wasps. The galls arise from twigs and are produced under the direction of several species of cynipid wasps (family Cynipidae) belonging to the genus Disholcaspis. So, you may find different types of bullet galls depending on the exact gall-making wasp species that directed their creation. Most bullet galls are more or less round-shaped and measure about 1/2" in diameter. Colors vary from light green to reddish-green, to light brown depending on the wasp species and the age of the gall. Some bullet galls are covered in very fine, short hairs, while others are completely smooth. They cause no appreciable harm to their oak hosts because they do not disrupt the vascular flow in the twigs. 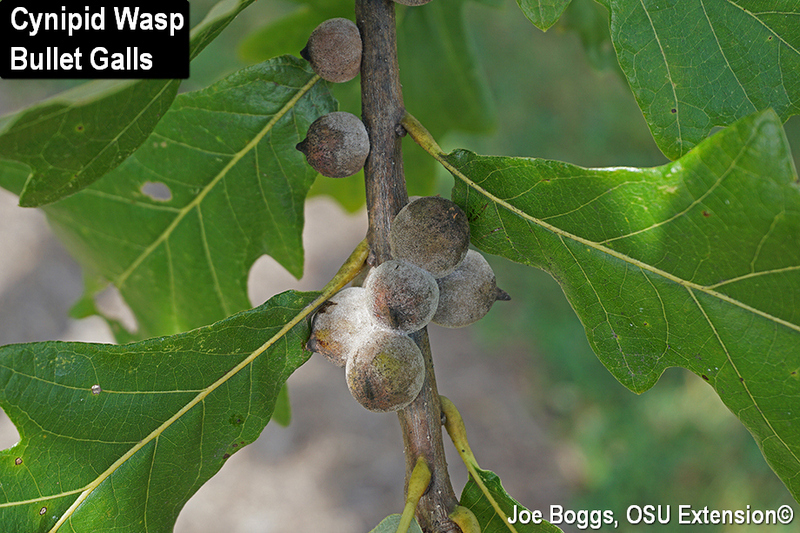 The life cycle of bullet gall-wasps involves two different types of galls produced at different times of the year. The current bullet galls will give rise to female wasps around the end of this month; no males are produced. Wasp emergence is heralded by a small hole in the gall. Once the wasps have emerged, the "spent" galls shrivel, darken in color, and some will detach from the oak stems over the winter. The self-fertile females crawl to a dormant leaf bud where they lay a single egg per bud. These eggs along with the resulting wasp larvae stimulate the tree to produce small, inconspicuous leaf galls in the spring. Both male and female wasps develop inside these leaf galls and adults emerge in mid-to-late spring. The mated females fly or crawl to newly elongated twigs where they insert their eggs through the phloem to be in contact with the cambium. Or, depending on the gall-wasp species, they insert an egg in a new leaf bud. This is important because the wasp requires the services of undifferentiated (meristematic) cells to grow their bullet galls. As with all galls produced by wasps, midge flies, and other insects, the bullet wasp gall-maker uses various chemicals to turn plant genes on and off at just the right time to induce and direct gall formation. Thus far, no researcher has ever duplicated this interaction without the aid of an insect gall-maker. Many bullet galls include extrafloral nectaries (a plant organ) in their gall structure. I find this to be incredible, but it's not unique to bullet galls. A number of other cynipid wasp galls also exude nectar including the oak bud gall produced by the wasp Neuroterus vesicula. The nectar exuded from the galls attract a variety of stinging insects including bald-faced hornets (Dolichovespula maculata) and yellowjackets (Vespula spp.) as well as biting insects such as carpenter ants (Camponotus spp.). Yellowjackets and bald-faced hornets are Jekyll and Hyde wasps. During much of the season, they chow-down on soft-bodied insects such as caterpillars and sawfly larvae. Their predatory lifestyle makes them beneficial insects. However, in the fall, they switch from high-protein diets to high carbohydrate diets. They can be a serious stinging-nuisance as they compete with our own high-carb consumption of soda, donuts, and certain adult beverages. Bullet gall-makers take advantage of the wasp's high-carb hankering with the nectar oozing from the extrafloral nectaries on the galls serving as "wasp candy." Of course, ants will also show-up to the sugar party. Presumably, the close attention of stinging and biting insects prevents the immature gall-making wasp larvae located within the galls from receiving the unwanted attention of predators and parasitoids. In other words, a little sugar bribe makes the gall-home safe for the gall-makers helpless offspring.